Different rifle for infantry and others? Going by media reports, the Army is going in for equipping infantry soldiers with a world-class assault rifle, while non-infantry soldiers would get a cheaper, "less effective", indigenous rifle. The saga of new assault rifles actually began in 1980 when 17 x 5.56mm rifles from 11 countries were imported by MoD to equip three Para Commando battalions and three Para Battalions. Despite successful trials, the red tape and mafia blocked imports, giving these 17 weapons to DRDO who took 15 years to produce the 5.56 INSAS rifle that was nowhere close to top 10 assault rifles of the world. The IPKF went to Sri Lanka in 1987 armed with the unwieldy 7.62 SLR rifles battling the LTTE armed with AK 47 assault rifles. Eventually, Army had to import 1,00,000 AK 47 rifles (then costing only US$ 300 apiece) to give 100 per infantry battalion in the IPKF. It may be recalled that the global tender floated in 2011 (with MoD approval) for new generation assault rifles with interchangeable barrels for conventional warfare and CI operations was finally scrapped in June 2015 despite being termed “Priority I” for the 382 infantry battalions. Reputed foreign firms participated in the trials for the double-barrel rifles, Army having taken conscience decision to go for interchangeable barrels, which had MoD approval. The plan was direct acquisition of 65,000 new generation rifles costing 4,848 crores to equip 120 infantry battalions. OFB was to then manufacture over 1,13,000 such rifles through joint venture (JV) with the foreign vendor providing ToT. The rifle was to weigh around 3.5 kgs with advanced night-vision, holographic reflex sights, laser designators, detachable under-barrel grenade launchers etc. It is not that the type of assault rifle the Army sought was not available globally, but what caused the tender to be scrapped was the DRDO coming up with the ‘Improved 5.56 INSAS’ dubbed Excalibur, which had been under development past several years. After the request for proposal (RFP) for the assault rifles was scrapped by MoD in June 2015, the Army in September 2016 re-launched its global hunt for assault rifles after similar bids over last decade were shelved on various grounds including corruption. What is being touted in the media is that the army had planned to procure some 800,000 state-of-the-art assault rifles from the global market, each costing about 200,000; that would have cost about 16,000 crore – significantly more than what the army can afford. but this is grossly incorrect since Army had all along planned to procure around 2,00,000 assault rifles, not 8,00,000 being reported now. in fact, only 65,000 (costing 4,848 cr) were to be imported and 1,13,000 were to be manufactured by OFB. Had this been pursued in 2011, Army's 140 infantry battalions would have already been equipped and balance in the process through a JV. The media has quoted the Army Chief having decided to now buy only 2,50,000 rifles from the international market, "and issue them only to combat infantrymen - the frontline foot soldiers who are directly in contact with the enemy". The remaining 550,000 army soldiers who are authorised rifles but serve mainly in non-infantry arms and services will get a new indigenous rifle, as per media reports; the army will choose between the INSAS-1C, designed by the Defence R&D Organization (DRDO), and the 'Ghatak', designed by Ordnance Factory, Kirkee. If the media is to be believed, even within an infantry battalion, not every one of its 800-odd soldiers will be issued a 7.62 mm assault rifle. These will go only to soldiers who can expect to be in direct contact with the enemy: its four rifle companies and the commando platoon, totaling up to about 565 persons per battalion. The remaining personnel would be issued other weapons such as 5.56 mm carbines and rifles. At 565 rifles for each of these infantry units, the total adds up to 250,000 rifles. 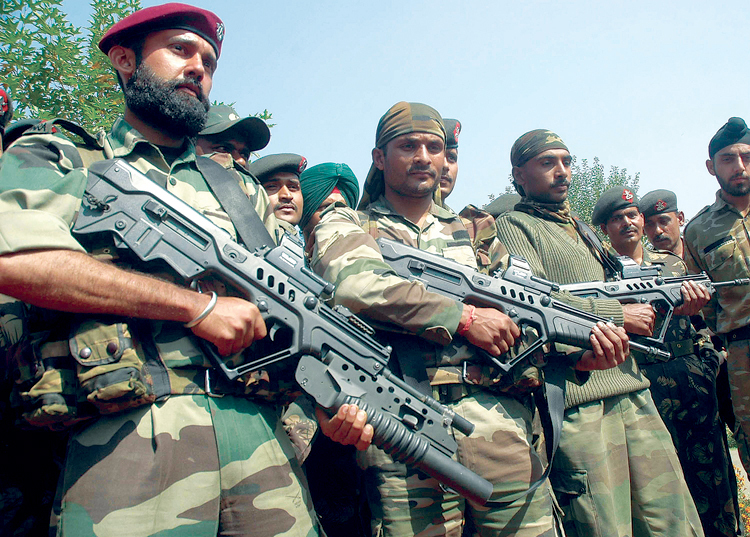 At 200,000 for each foreign assault rifle, equipping these 250,000 infantrymen will cost 5,000 crore. For the remaining 550,000 non-infantry soldiers, their indigenous rifles – INSAS-1C or the Ghatak rifle, whichever is chosen. This is some weird mathematics given the fact that Army went on to combatize the non-combatant employees (NCEs) decades back realizing that every man jack will need to fight in war. The Ghatak and INSAS 1C both remain "works in progress". How long the "work in progress" will be is not known though rumoured to be small, but it certainly will be shorter than the procurement process for importing the 250,000 "world class" assault rifles. More significantly, the "work in progress" is not really material. What is relevant here is that they should clear the trials, for which the standards should not be diluted to dump these personal weapons on to what are ironically not being considered as frontline foot soldiers, even creating something like a class system of rifles within an infantry battalion. The question here is whether we can really make a strict division between the conventional war and counter insurgency where hybrid war that we have been fighting past decades includes all forms of warfare including conventional and irregular warfare, terrorism and insurgencies included. It is a borderless war with frontlines not clearly defined. Having two different type of rifles even within an infantry battalion catering for only 565 persons as frontline soldiers equipped with "world-class" assault rifles indicates grossly muddled thinking. The record of the DRDO-OFB in providing state-of-the art small arms to the Army has been atrocious, the versions of INSAS provided so far being sub-standard compared to global counterparts in this category of weapons. 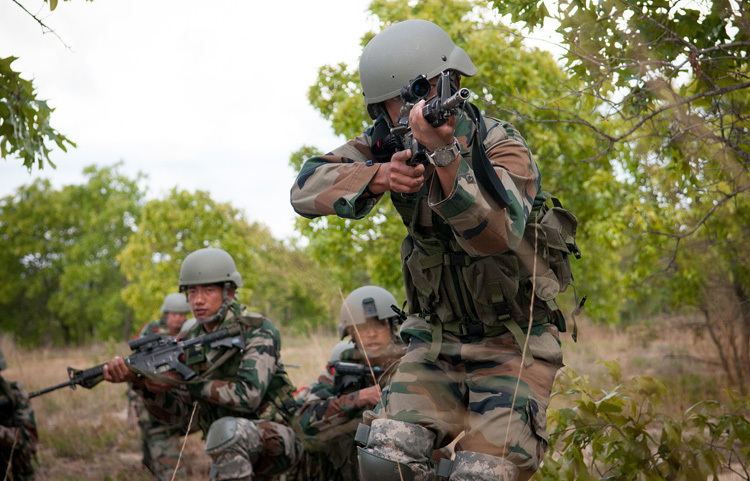 The present ongoing exercise appears to be to somehow push the INSAS-1C to the 550.000 army soldiers not being labeled frontline soldiers under the pretext of the requirement being of a cheaper, "less effective", indigenous rifle. One can also expect that the import of the so called "world-class" imported 200,000 assault rifles will be suitably stalled, while the INSAS 1-C gets fielded, followed by the question why shouldn't the balance infantrymen get the same weapon. This is the trap that must be avoided. In an article published in July 2017, Debalina Ghoshal in her article titled 'Why Indian Army's hunt for assault rifle under Make in India is no good' quotes an veteran Army Brigadier and defence analyst Rahul Bhonsle saying, "DRDO projects will remain technology demonstrators given that they do not provide confidence to the customer, the Indian armed forces, that these weapon systems are modern state-of-the-art". The Army Chief maybe having his own reason for wanting to import 250,000 assault rifles. However, the original plan of importing only 65,000 and balance equipping being done through JV with foreign partner should be as good an option - saving much money. More than 1,000 foreign firms from 40 countries want to enter the defence sector in India. Prudence would demand that strategic partnership with private companies in India will be a better and faster option, the DRDO-OFB having managed to even scuttle import of carbines and light machine guns for the Army, while themselves being unable to produce anything worthwhile in this category.